Wow! 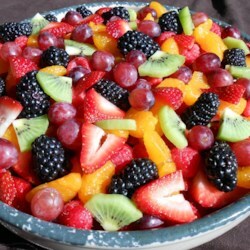 This really is a "Perfect" Summer Fruit Salad! It's bursting with a ton of virbrant colors and flavors! It's not only pretty to look at, but it tastes wonderful and is good for you too. A terrific blend all your summer favorites -serve nice and chilled! This recipe definitely doesn't disappoint.